Taxon: Aloe vera (L.) Burm.f. Locality: Mexico, Yucatan, Sotuta, Mexico: Yucatan: Sotuta. Tabi: A resident of Tabi's yard. Elev. 24 m. Highly disturbed. Succulent plant ca. 70 cm. tall. UTM: Zone 16, Q 0302134E 2278956N Datum: WGS 84. Lat. 20.59930°N Long. 88.89868°W Datum: WGS 84. 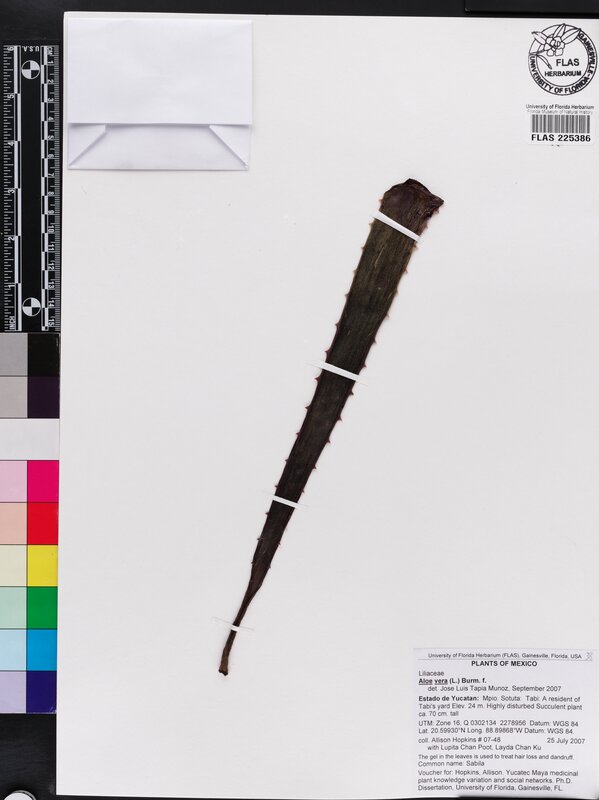 Occurrence Remarks: [Common name:] Sabila --[Ethnobotanical note:] The gel in the leaves is used to treat hair loss and dandruff. --[Label footing:] Voucher for: Hopkins, Allison. Yucatec Maya medicinal plant knowledge variation and social networks. Ph.D. Dissertation, University of Florida, Gainesville, FL.